long service to the Practice. 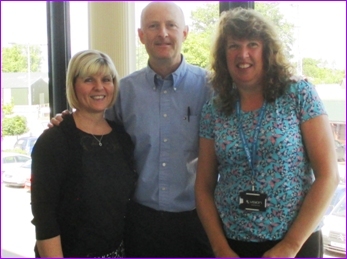 Both Tracey and Aileen started out as receptionists at Lodgehill Clinic in 1988 and 1989 respectively. They are pictured rightwith Senior Partner, Dr Calum Macaulay. We are also delighted to welcome Kate and Alison, our new receptionists. Plus a new Practice Nurse, Hayley Shepherd, will be joining the Practice in September. Hayley will be available to carry out all the usual nursing procedures and will also be assisting GPs with specialised clinics and supporting the duty doctor. Over the month of June, our three nurses and four healthcare assistants saw 2,458 patients. They also dealt with 253 telephone consultations and 46 home visits to patients who are unable to attend the surgery. Our healthcare assistants also assist the GP with minor surgery, vasectomies and other specialised clinics. Routine asthma, diabetic checks, ear syringing, cervical smear tests, childhoods immunisations, injections and blood tests are just some of the duties undertaken by our nursing team and we look forward to Hayley joining the team in September. Our flu campaign will be starting again at the end of September/start of October. Please keep an eye on our website, the reception desk and local pharmacies for more information nearer the time. If you are 65 or over or fall into one of the “at risk” categories, you are eligible for a flu vaccination. If your child is between 2-5 years of age, they are eligible for the childhood flu nasal spray. Children aged 6 months – 2 years that fall into any of the “at risk” categories also qualify. Children over the age of 5 will be vaccinated in school. All patients aged 65 and over qualify for the pneumococcal vaccine. This is only given once, so if you have already had this vaccine, you will not require it again. All babies born after 01/05/2015 will be eligible for the Men B vaccine. Vaccines will be administered at ages 2 months, 4 months and a follow –up booster between 12-13 months. The GP can this discuss further at the baby’s routine 6-8 week check. In recent years, there has been a large increase in cases of meningitis and septicaemia caused by MenW across the UK. In response to this, it has been recommended that all school leavers should be immunised to help protect them from this life threatening infection. The vaccine recommended provides protection against diseases caused by MenW but also three other types (A, C and Y). It is called the MenACWY vaccine. This vaccine will be replacing the Men C vaccine. It will be offered to all patients under 25 who have not had the Men C vaccine since the age of 10. Patient born between 02/09/1944 - 01/09/1945 (aged 70) and also those born 02/09/1936 – 01/09/1937 (aged 78) are eligible for the shingles vaccine.